Step 1 Melt butter in skillet over medium heat. Add green onions, white onion, carrots, celery, red and green peppers and garlic. Saute until soft, about 10 minutes. Step 2 Combine salt, black pepper, cayenne pepper, nutmeg, cumin and eggs in large mixing bowl. Add ketchup and half-and-half. Blend thoroughly with vegetable mixture. Add turkey, chicken sausage and bread crumbs to vegetable mixture. Mix with hands to form loaf. Step 3Place in a greased 9x5-inch loaf pan. Bake at 350 degrees until cooked through and nicely browned, 45 to 60 minutes. Let rest 10 minutes before serving with Gravy. In Recipes-list.com we have selected the most viewed recipes from category - Main courses . Enjoy the best recipes specially selected for you! 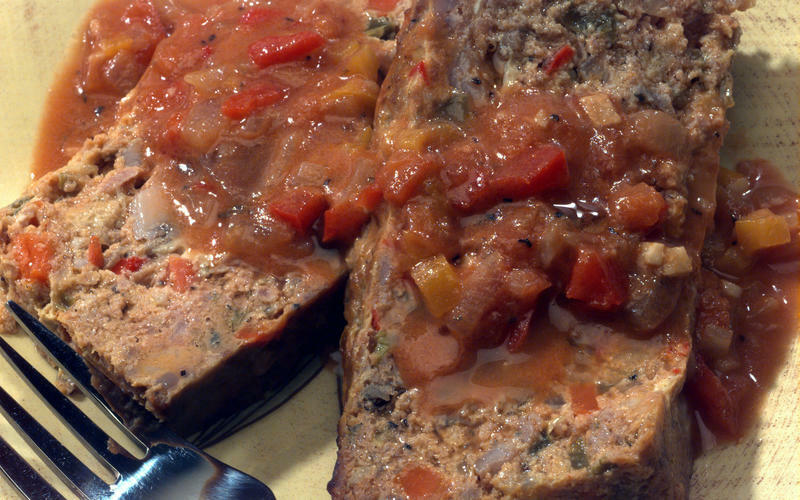 Ammo Meatloaf and Gravy is the right choice that will satisfy all your claims.